i should know better. this happens to me every year. i get so starved for personal shopping during xmas (compounded this year by shopping for the burlesque), that as soon as i’m left to my own devices- i explode and tell myself that i need to buy everything RIGHT NOW! it’s like being on a starvation diet- at some point, the dam will break, and everything will go to hell (usually me cleaning out the fridge with my face, or me buying a bunch of crazy crap). the worst thing is that i am somehow able to convince myself that i deserve it- that i am entitled to this wallet draining and overstuffing. the truth is that i haven’t balanced my checkbook in over a month, i have no idea how much money i really have (or need to get through the month)- and just like my rapidly expanding waistline, i don’t plan to do anything about it until january first. what the hell kind of f-ed up mentality is that? we can always start over tomorrow, or monday, or next year- but how many dollars and calories are lost while we’re waiting for our perfect “start over day” to come? 1. stop starving myself so that i stop needing to binge. 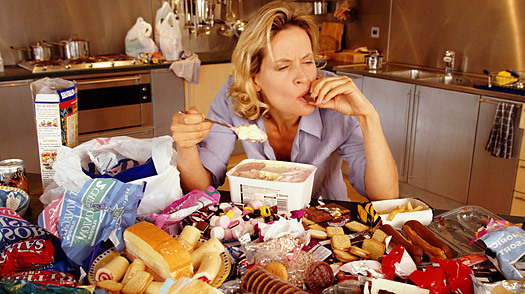 2. when i do binge, get right back up and start over immediately. perfection isn’t really an option (as much as i might like it to be), but i’m pretty sure i can muster up the effort and willingness to keep trying to get better if i allow myself to accept the (sometimes) discomfort of the reality that is moderation.